"Simulate" crafting an equipment item by choosing an item type, level, trait, racial style, quality, and set (e.g., Ashen Grip). Defaults to the player's current level. TCC will display the icon and quantity for all of the materials needed to craft the item. Add your virtual item (as many as you want) to the Item Order / To-Do List. The Item Order section will display all of the items you added, in an easy-to-read scrollable list. A cumulative summary of ALL the materials required to craft your Item Order is displayed, as well as the total Market Value of all those materials (according to Master Merchant, if you have it). Mouse over the Market Value total to see a detailed breakdown of the material component prices. 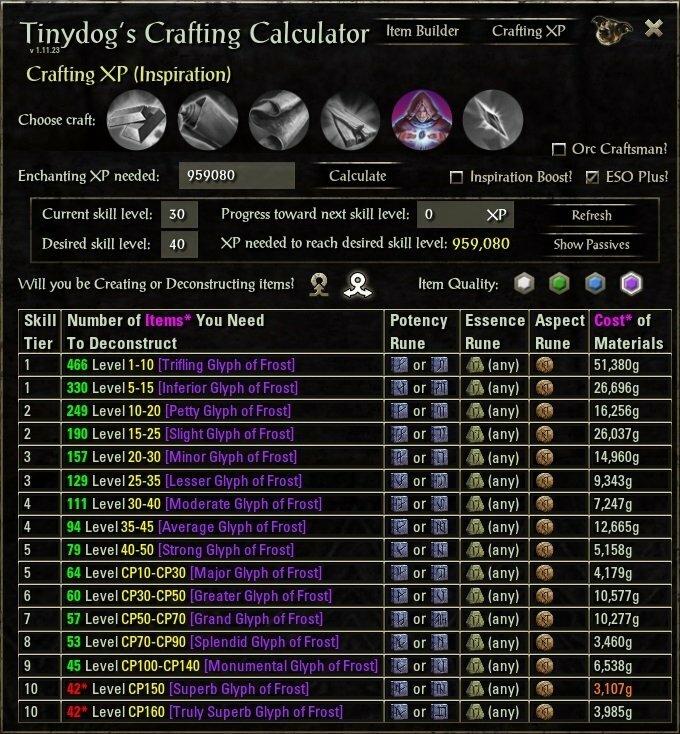 Note: Master Merchant is NOT REQUIRED in order to use Tinydog's Crafting Calculator. If you do not have MM, though, material price information will not be shown. If a material can be refined from sub-components (Malachite, Dwemer Frame, Cassiterite), then the sub-component material and quantity needed are also shown. If there is Master Merchant data for a material and its sub-components (e.g., Cassiterite and Cassiterite Sand), then the cheaper average price will be used when calculating the total Market Value. 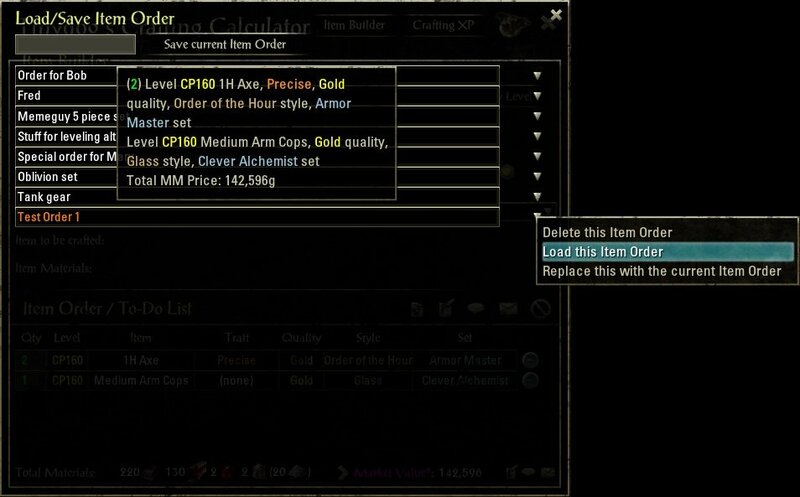 Click a button to paste a summary of your Item Order - or a summary of the required materials - to a new in-game mail, to the chat box, or to the clipboard. Your entire Item Order is saved automatically, so it will still be there the next time you log in (unless you clear the order). Save your Item Orders (as many as you want), then Load them at a later time on any character. Hover over any material icon to get the full standard tooltip for that material including its description, and the Master Merchant pricing information (if you have MM). Right-click a material icon to get the standard context menu with "Link in chat", and "Stats to chat" (if you have MM). Note: Some of the icons may not register your right-click. This is a known issue that I am investigating. 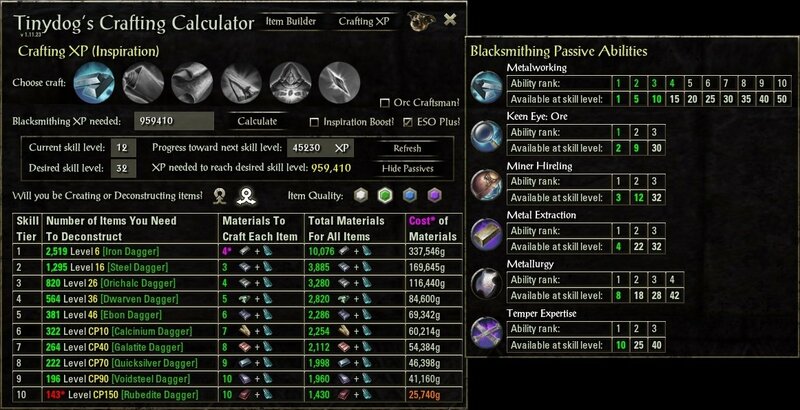 For Blacksmithing, Clothing/Leatherworking, Woodworking and Enchanting, calculate how much Crafting XP (Inspiration) you need in order to get from your current skill level, to whichever skill level you want to reach. Although TCC defaults to your character's current skill level and progress, you can enter whatever values you want. This is useful when assisting other players with their crafting. TCC will tell you exactly how many items at each skill tier you will need to deconstruct or create, in order to reach your Crafting XP goal. Example: 100 Level 6 Iron Daggers, or 70 Level 16 Steel Daggers, or 50 Level 26 Orichalc Daggers, etc. The grid also shows the materials needed to craft each item (e.g., 4 Iron Ingots), the total materials needed to craft ALL of the items for each skill tier (e.g., 100 Level 6 Iron Daggers require 400 Iron Ingots), and the total Cost of Materials based on the average Master Merchant price (if you have MM). Note: For most equipment crafting skill tiers, the maximum "XP per raw material" is gained from deconstructing the lowest level item for that material type (e.g., Level 16 for Steel, or Level 26 for Orichalcum). However, there are a few oddball skill tiers where the optimal item level is not the minimum, such as with Iron (Level 6 Iron Daggers are optimal). 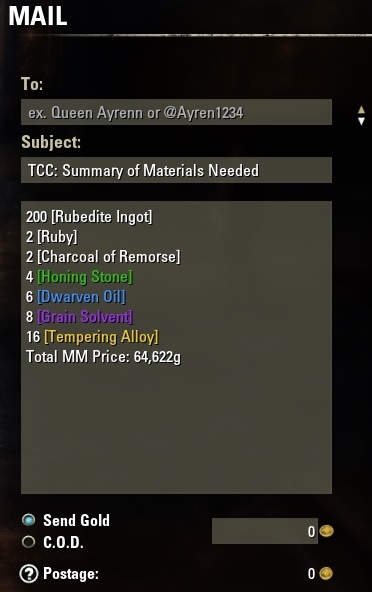 TCC highlights the material quantity for these "oddballs" in a purplish color (see Blacksmithing screenshot), so you don't accidentally craft items at the wrong level that will yield sub-optimal XP. Choose whether you will be getting your Crafting XP by creating items or deconstructing items, and the quality of the items you'll be deconstructing (or creating, if you're doing Enchanting). The grid, item/material quantities, and costs will update accordingly. EXAMPLE (see screenshot): Your current Blacksmithing skill level is 12, and you already have 45,230 Blacksmithing XP progress toward the next skill level. You want to reach skill level 32 so that you can purchase the rank 3 Miner Hireling ability. TCC calculates that you need 959,410 more Blacksmithing XP in order to reach skill level 32. You choose to deconstruct green quality items. In order to earn 959,410 Blacksmithing XP you will need to deconstruct 245 Level V7 Quicksilver Daggers, or 215 Level V9 Voidsteel Daggers, or 147 V15 Rubedite Daggers. 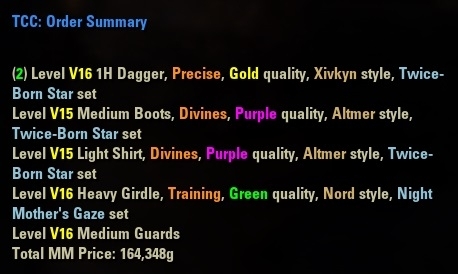 You like the idea of deconstructing fewer items, but you see that the total Cost of Materials is actually cheapest for the Quicksilver Daggers so that's what you decide to go with. Click the "Show Passives" button to pop-out a window that lists all of the passive abilities for your selected craft (passives such as Metalworking, Keen Eye, Hireling, Temper Expertise). Grids will indicate which passive ability ranks you've purchased, the minimum skill level at which each rank of that passive ability is available, and whether your character's skill level is high enough to purchase each rank. Click on an "Available at skill level" number in order to copy that value to the "Desired skill level" box in the calculator window. Everything will recalculate. 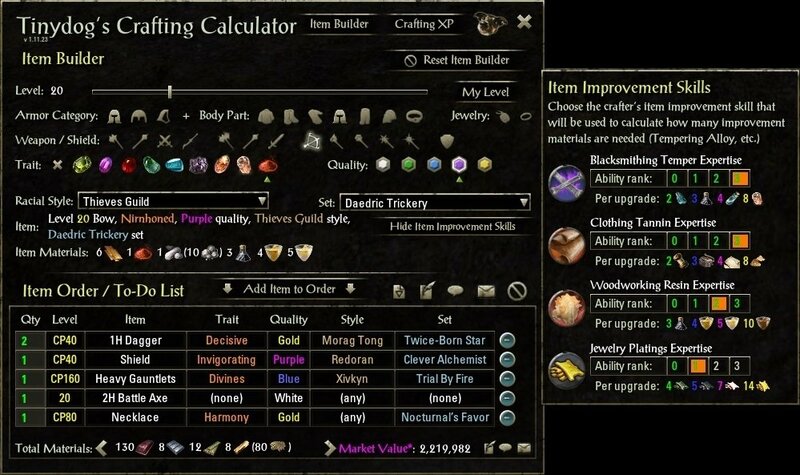 The Item Builder and Crafting XP Calculator DO NOT limit your available choices based on your character's learned traits, racial styles, or crafting level. You can choose any item level/trait/style, or Current Skill Level. TCC is intended to be a calculator, not a character management tool. There is no Item Builder for Enchanting, Alchemy, Provisioning, or Furnishings. There are other add-ons that have those trade skills covered quite well. 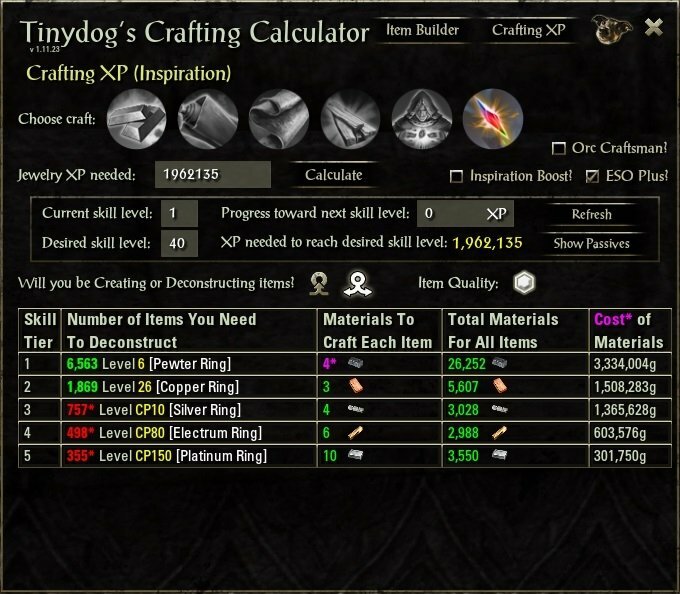 Alchemy and Provisioning are not currently included on the Crafting XP (Inspiration) calculator. TCC does not keep track of your trait research or learned racial styles. Other add-ons have those covered. TCC does not keep track of your Crafting Writ quests. Other add-ons have those covered. Actual item stats, and set bonus information. Automatic crafting of items while standing at the correct crafting station. Detection of order fulfillment (the item has been crafted). 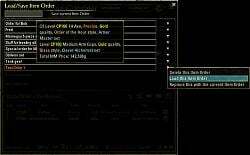 Ability to edit an order item. Right-click "Copy to TCC Item Builder" for linked items in chat. Special thanks to Philgo68 for allowing me to integrate Master Merchant pricing, and to sirinsidiator for his Awesome Guild Store icons. If you wish to donate, click the icon! Many thanks. 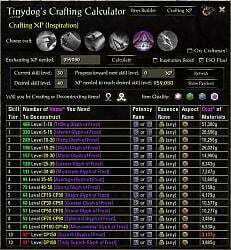 - Jewelry XP added to the TCC Crafting XP (Inspiration) calculator! - Jewelry added to TCC Item Builder! - Jewelry XP will be added to TCC Crafting XP calculator soon! - Jewelry Crafting is coming soon! - In Item Builder, added a pop-out that lets you select the Item Improvement skill rank (Temper Expertise, etc.) of the crafter who will be making the items, in case it differs from that of your character. This affects how many improvement materials (Tempering Alloy, etc.) will be needed to craft the items. - Fixed a bug where in the Crafting XP calculator if you reduced the selected item quality (e.g., changing from purple to white quality), the improvement material tooltips would still appear as you moused over the blank spots where their icons used to be. - Fixed a bug where the Reset Item Builder button would appear on the Crafting XP tab. - In Crafting XP, added logic to compensate for the maximum inspiration-per-decon cap at lower crafting skill levels, which results in not getting the full decon XP for higher level items. For example, at blacksmithing skill level 1, deconstructing a white CP150 Rubedite Dagger will only gain you 1016 decon XP, even though the dagger is worth 5773 decon XP. A mouseover tooltip on the Number of Items quantity will tell you how many EXTRA items will need to be deconstructed to make up for the lost decon XP. Credit to "Atlas at-Sal" for bringing this to my attention. - Renamed Weighted trait to Decisive. - Added Frostcaster and Grim Harlequin styles. - Alphabetized the Racial Style list since there are so many styles now. - Made the Save/Load Order text box wider to allow for longer order names. - Updated the embedded LibAddonMenu-2.0 to the latest version, 2.0 r23. - Renamed Exploration trait to Prosperous. - Fixed bug when opening TCC from a character with lower crafting skills. - Some feature enhancements are coming soon! - Added "Load/Save Item Order" feature to the Item Builder. - Saved orders are accessible by any character. - Added "Copy to Clipboard" buttons for the Order Summary and Materials Summary. - Added TCC to Addon Settings, with instructions and a configurable option. list item is beyond the visible scroll area. - Added the Ancient Scale sub-component to Goldscale racial style material (Akaviri). - Fixed error when displaying Clothing/Leatherworking Passive Abilities. - Fixed error when launching TCC if you have the German edition of ESO. - Fixed error when launching TCC if you don't have Master Merchant. - Added Blue and Purple quality for equipment deconstruction XP. - Quality material quantities (Honing Stones, etc.) will now calculate based on the character's improvement passive ability rank (Temper/Tannin/Resin Expertise), rather than assuming that the character is at max rank. 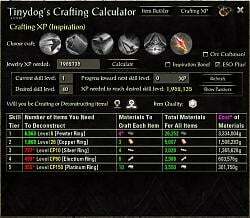 - Added highlight to the cheapest Cost of Materials in the Crafting XP Calculator. - Added checkbox for ESO Plus Membership, which adds 10% to all XP. - Added fancy tooltip to Market Value detailing the price for each component material. - Fixed Market Value calculation. - Fixed the disappearing mouse pointer bug when copying an order summary to mail. - Added "(with RGB color codes)" to the "Copy Order Summary to Mail" tooltip, so the user knows why they're seeing hexadecimal gobbledegook. You, sir, are a saint. Saved me a lot of troubleshooting time! Thank you! The current version is displaying error message and is not working after eso update on 3/11/2019. Thanks for the heads up. I'll work on it. EDIT: Here's a temporary workaround, until I release a fix. 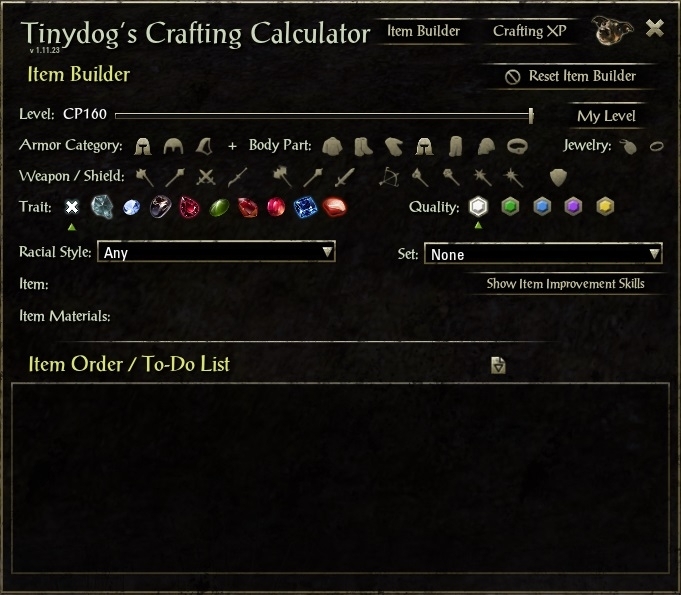 If you have Dolgubon's Lazy Writ Crafter and it is updated, then Tinydog's Crafting Calculator won't throw any errors. Last edited by @tinydog : 03/12/19 at 06:03 PM. It is an awesome add on. Awesome love your AddOn; thanks for the updates!!! Any chance for update? The number of platings needed for jewelry is not correct right now. It should be 1/2/3/4. Updated the Jewelry Platings quantities! Yes! I'll be taking a look at that this weekend. If it is possible to Japanese, I would like to ask for a translation. I perfectly understand that Alchemy etc. is something that is covered elsewhere (although i didnt find a calculator for pricing/material-list without actually crafting the stuff). But for the means of tracking ordered stuff it would be splendid if you could incorporate a means of tracking glyphs. For doing the enchants i use "Quick Enchanter", but i am really looking for a ingame order-tracking. I really like the feature to create invoice for the materials so my guildies know what materials I'd need (either ahead or as payment). Any chance you would perhaps consider implementing something like it? 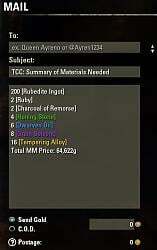 Since people already use TCC Item Builder for order tracking and material pricing, it would make sense for it to also cover Enchanting, Alchemy, Provisioning, and possibly even Furnishings. That would take a lot of work, and a fair amount of time. Still, not a bad idea! i am really looking for a ingame order-tracking. Have you tried Hotep® Crafting Freelancer? Ok. 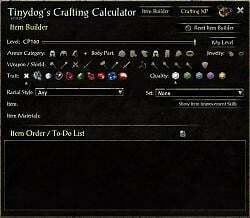 I did give it a try - but honestly - its beyond comparison to tinydogs crafting calculator. I'll happily stick with tinydogs as it (besides the enchants) completely covers my needs.